DEARBORN, MI—Having isolated the origin of the blaze that caused the company to halt production of the popular vehicle, representatives at Ford confirmed Thursday that the fire at the truck parts supplier’s plant was caused by a spooked F-150 knocking over a lantern. 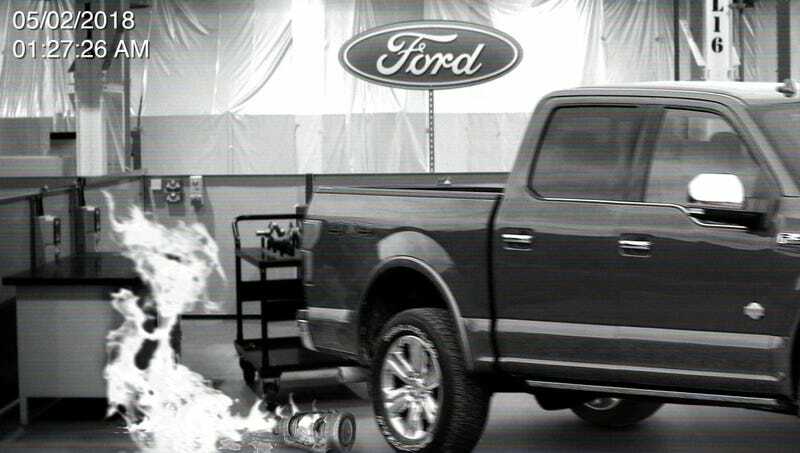 “After surveying the damage at the factory, we’ve concluded that the fire started when a kerosene lantern was tipped over by a skittish truck that became frightened by the sound of an engine backfiring,” said Ford executive vice president Joe Hinrichs, adding that by the time workers had calmed the frantic F-150, the conflagration had already spread out of control. “Although our trucks are usually very well-behaved—especially the V6 EcoBoost SuperCrew models like this one—the backfire caused this young 2016 truck to become agitated and bolt, tearing through the factory at 80 miles per hour. Tragically, several fine pickups were lost in the inferno.” Hinrichs added that the company would resume production as soon as damage to the plant is repaired and the runaway F-150s that busted through the factory gate to escape the fire could be retrieved.